Please refer to our stock # 1-1055 when inquiring. 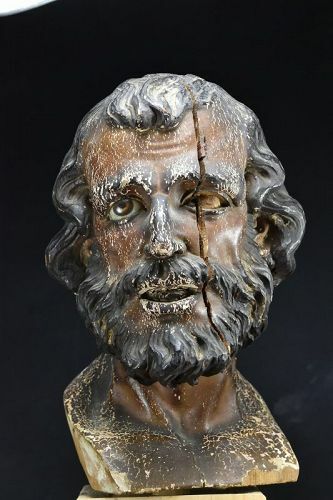 Rare and important head of a bearded apostle, his face showing a strong and passionate expression. Polychrome wood. Eyes made of glass painted inside. Of Spanish origin, dating back to the 18th century, this head was found in the Philipines in 1978, together with the centurion head (see our stock number 1-1013 ). Height: 29 cm. Old accident on the left side of the head, left eye missing, (see photos), otherwise very good condition. NOTE: This head belonged originally to a large statue which was displayed beside a large crucifix. IMPORTANT: due to the size and weight of the head, please consult us about the shipping cost. Important Head Of A Centurion, 18th century Statue Head of Buddha, China, 18th C. Statue of Zhen Wu, the God of the North, China, 18th C.